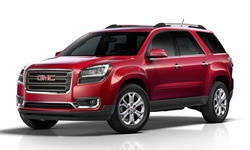 With the 215 kilowatts 3.6L V6 engine, 6-speed shiftable automatic transmission, and all-wheel drive, the 2015 GMC Acadia has been averaging 41.2 L/100km (liters per 100 kilometers). Unlike other fuel economy surveys, TrueDelta's Real-World Gas Mileage Survey includes questions about how and where a car was driven. So you can get an idea of the GMC Acadia's real-world km/L based on how and where you drive a car.